It's Monday....Time for another sketch challenge from MJ at TechnoStamper! 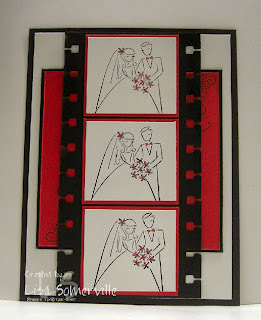 This weeks layout was great for making my card look like a filmstrip, and perfect to use with Stampin' Up! 's To Have and to Hold wedding set. Very Cute!! I love the sprial punches. Great set to use! I love this, I actually just picked this set for my prize on the SSUS group. Because of you, I love all you samples with it. This one is right up there with the rest! Thanks so much for playing Lisa. 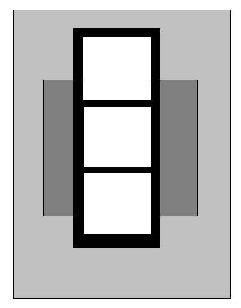 I agree - this layout is perfect for the filmstrip. GREAT card! Very pretty! I love the simplicity of it with the clean lines. This set is perfect with the layout! Superb job, Lisa! love the crisp red/black/white color combo. Bravo! Bravo!